New .doc and .pdf version of the General Society Application is currently being created and will be posted when it is finished. At present contact your State Society for an Application. a) Applications can be typed online and then printed. Applications cannot be submitted online. Applications must be printed on 8-1/2”x11”, acid-free paper (available in many stationary stores). Since approved applications are retained indefinitely in the Society Archives, acid-free paper helps avoid degradation. b) Applications to a State Society should be submitted in duplicate, along with one copy of all related genealogical proofs, to the appropriate state society in which the applicant resides. The final Application copies should be unfolded. Please refer to the State section of this website for contact information. The State Society will advise the fees involved for the State. 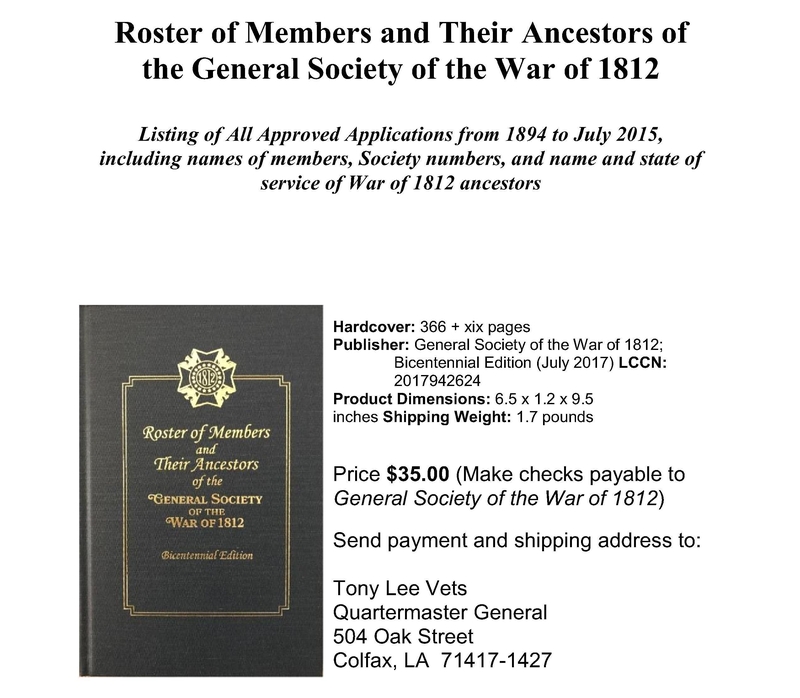 Annual Dues of $12 should accompany the Application, made out to the General Society of the War of 1812.
c) When States submit an Application to the Registrar General for approval; please ensure the assigned State Number is on the Application. Annual Dues of $12 should accompany the Application, made out to the General Society of the War of 1812.
d) Proofs are not forwarded to the General Society. Genealogy verification is the responsibility of the State Registrar and or Genealogist. Genealogical proofs are retained by the State. Only the Application Form and a check are to be sent. No additional documents should be sent. e) The information on the soldier’s service must include dates of service, regiment, state of service, etc. Without the dates of service (even approximate), we cannot confirm they qualify during the period that is approved. f) The State Registrar submits all applications to Registrar General Eric E. Johnson, unfolded. 2) FOR APPLICATIONS to Members at Large (with no State Society), the following additional instructions apply. a. Print one copy of the Application for use as a WORKSHEET, Plain 8-1/2”x11” paper can be used. Complete one copy and, along with all documentation (proofs), submit it to the Vice President General, Members-At-Large (VPG-MAL) along with a check made out to the General Society of the War of 1812 in the amount of $65.00 ($25.00 dues and $40.00 Genealogist examination fee). The VPG will then submit the worksheet to the Genealogist General for examination. b. Any questions that may arise will be communicated to the Applicant by the VPG-MAL. c. The VPG-MAL will advise the applicant when the submitted information has been found acceptable and will return the Worksheet to the applicant. d. The applicant should then, using the worksheet and any suggested corrections as a guide, submit two final copies of the Application, printed on 8-1/2”x11” Acid-free paper, to the VPG-MAL for final processing. Please note an Application requires the signatures of the Applicant as well as those of the Proposer and Seconder. Where possible, at least one should be a member of the Society. If the applicant does not know a member, then he should submit two letters from persons who can vouch for his good character, such as a member of the clergy, judge, or the like. A record copy of an SAR or SR Application is also acceptable. e. The VPG-MAL will keep the applicant apprised of his Applications progress.